WASHINGTON — Relativity Space, the startup developing a small launch vehicle making extensive use of 3D-printing technologies, has brought on board a former SpaceX and Virgin Orbit executive to help grow the company. Buzza was previously vice president of launch at Virgin Orbit, another small launch vehicle company. He left Virgin Orbit in May, according to his LinkedIn profile, after four years at Virgin Orbit and Virgin Galactic, the company from which Virgin Orbit was spun out from in 2017. Prior to Virgin Orbit, Buzza was a vice president at SpaceX, joining the company just months after its founding in 2002. He joined SpaceX from Boeing, where he worked for 14 years on advanced research and development programs. Ellis said he met with Buzza after learning that Buzza had left Virgin Orbit “to find his next adventure,” and the two hit it off. “Once someone likes that becomes available on the open talent market, you really want to jump in,” Ellis said. Buzza is the latest in a series of “pretty big hires” at Relativity, Ellis said. The company recently hired its first director of business development and sales, as well as engineers who previously worked at Blue Origin, SpaceX and Virgin Orbit. Relativity now has 32 employees at its Los Angeles headquarters and test site at NASA’s Stennis Space Center in Mississippi. “We’re growing quickly from there, but trying to keep the talent bar very high,” he said. 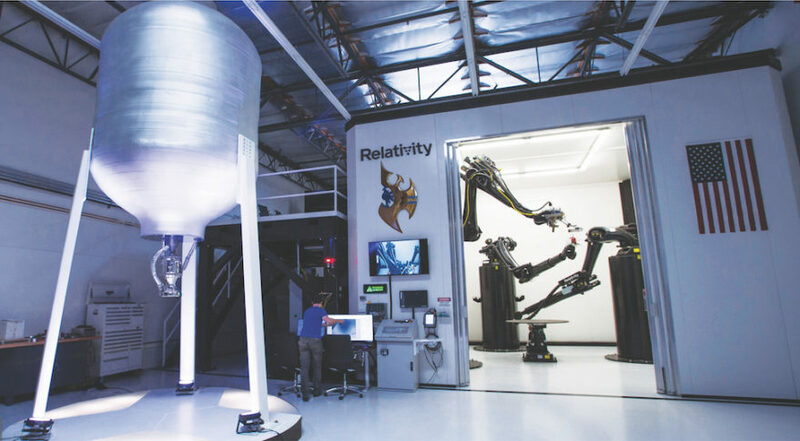 Relativity is one of dozens of ventures developing small launch vehicles, but stands out from its use of additive manufacturing to make most of the components of its rocket, reducing production times and costs. The company’s Stargate 3D printer recently achieved a milestone by passing what Ellis described as the “most stringent” quality standard in the aerospace industry. “That means there’s an extremely low presence of any material flaws or defects,” he explained. “This is actually overkill for the vehicle we’re developing now,” he added, but demonstrates that 3D printing can meet existing industry quality standards. The first launch of the Terran 1 rocket, capable if placing up to 1,250 kilograms into low Earth orbit, is scheduled for as soon as late 2020. Ellis said the company is signing more letters of intent and memoranda of understanding with potential customers, but has not announced any firm launch contracts yet. “Stay tuned for some more news there,” he said.